Last week, our eBook retailer, Pronoun, surprised us all when they doubled our author royalties, released the long-awaited Author Pages, and opened the door to Free eBooks. I had always wanted to offer something to my readers for free, but previously Pronoun’s lowest price had been $0.99. This, as you can imagine, was big news for Frankie and me. Almost immediately, I dropped the price to FREE on my fresh publication, A SHINY FOR TRICK. Then I flung it to the masses and more or less forgot about it. Today I checked my email. Pronoun has been sending me updates on how my sales have been. Since I dropped the price to free, I’ve sold 29 copies. Granted, I’ve not turned a profit on any of these books, but 29 is about as many digital copies that I’ve sold of THE BLOOD OF NERYS. I had hoped this would happen. I am so glad that it did. I turned to my roommate this morning and told him about my discovery. We discussed something he had heard somewhere about marketing. That it’s best to have one free product, one cheap product, and a lot of your real product. Most people will pull the trigger on a free book without so much as a second thought. They might never read it, but they CAN, and that’s all that matters at the moment of purchase. Offering something for free seems counter-intuitive. After all, at this point you’ve spent hundreds of hours on the thing and likely had to pay for editing, cover design, or other services. The important point to keep in mind though is that almost anyone will pick up a free book if they are even slightly interested in it. With your free book, you are casting a net far and wide, hoping some of the readers you reach stick around. This is the appetizer. At this point, anyone who took the time to read your free book should know what to expect from your writing. Plus, they’ll be done with the free book quickly, and hopefully want to read something else. That’s when you bait them again with the cheap product. You might want to have 2-3 of these directed at different audiences. If you’re planning on writing books for both adults and young adults, you would probably want one of each. If you have to choose one, choose Young Adult (YA). A lot of adults enjoy these. But start with one, and then move on to your Real Product. The cheap book should be a singular example of what you’re about here. Develop a full story, hook and hold a reader, give a satisfying conclusion. They should read this thing and want to read more books. Alright. Give ’em Everything You’ve Got. Time for the real thing. Your crowning achievement. That beloved world you’ve been dying to write that you plan to spend a lot of time exploring. This should be where you put your series. You might have more of these later. This is what you’d mainly be writing from now on. Keep working on major standalones or major series directed at any of your audiences in the genres you will write. Basically, you’d want to write a free book, then a cheap book, then a real product, and then spend the rest of your career rounding out your listings. My Free Book is A SHINY FOR TRICK. It’s directed at all audiences and reads like a grim (not Grimm) fairy tale. It’s mostly lighthearted at the surface, but it does dabble in some darker themes like obsession and starvation. It’s 17K and written for a younger audience, but to adults it might feel like a Pixar short. Rather adorable and entertaining. It’s pure fantasy–magical creatures, other worlds, magical boxes and magical treasures. My Cheap Book is THE BLOOD OF NERYS priced at $3.99. This was actually my first book. It’s definitely for an adult audience. It has a little gore and a lot of swearing. The setting is dystopian with a blurry sense of setting (this is intentional. Whether or not this is our world gone awry or another world is entirely up to your imagination. Either works). It deals with large philosophical concepts like God, magic, and science. It’s medical science fiction with a twist of fantasy, with blood as a main component, and finished in one book. My Real Product is ACHILLEA and the books that will follow. This is not published yet, but will be a trilogy, and then a later trilogy, and then some. I will be spending a lot of time in this world. I have built a familiar sense of place and person. I know these characters as well as I know real people, and I love them dearly. ACHILLEA was the first book I ever finished, and I’ve poured countless hours into refining it to make it perfect. This is an adult epic fantasy, rife with powerful female characters, espionage, and turmoil. ACHILLEA sits at 137K. The second book is in progress and currently at about 38K. (My foolish writer brain thinks writing book 4, the first of the second series in this world, is somehow a great idea, so that’s sitting at about 8K, too).I cannot wait for all of you to meet these characters. They’ve been with me a long time. Heike, Achillea’s surly captain, is my belligerent muse. Thanks everybody! Have a great weekend! S.K. Balk lives in the frozen wasteland of Northern Michigan. She is the author of the dystopian medical sci-fi THE BLOOD OF NERYS (also available in print) and short fantasy A SHINY FOR TRICK (forever free for your entertainment!). Check out the #WriteTip category for more writing advice and tools from Frankie and Sam! I have been -SO- busy. Doing what I am supposed to be doing and devoting my soul to the words. Check out the #SamWIP category every Monday to hear about Sam’s current projects! S.K. Balk lives in the frozen wasteland of Northern Michigan. She is the author of the dystopian medical sci-fi THE BLOOD OF NERYS (also available in print). #WhateverWednesday The Dragon Gets a Surprise! My husband was acting all suspicious last night before I went to work. He had this side-smile he usually gets when he is plotting something and disappeared not long before I left for work. To say I was intrigued is an understatement. I knew he was up to something, but he didn’t give me so much as a hint as to what he was scheming. Then, after about an hour of wondering and worrying where he was, I got a call from him. He was on his way home, and he had bought me something that I’d been wanting. Now, there was only one thing that I’ve been moaning about for a while now, and it has been my poor old laptop, Midway. Last week, Windows 10 updated three times on Midway. The last one was on Sunday and it all but killed my lovely workhorse. Afterwards, Midway took over an hour to switch on and in the end I had to force close the damned thing. When he finally did boot up, half the programs were struggling to run and I was so angry! Looking at social media, I am not the only one to find their laptop completely mucked up after this update. There are a lot of angry Windows 10 users out there! But this was the final straw for Midway. I use him so much his keys are scratched and the letters have worn off. His memory is slowing down and he struggles with some of the things I demand of him these days. I’ve had to dive into his code in order to disable some bad processes which rendered him useless. In all, Midway has been on the way to laptop heaven for a while now. 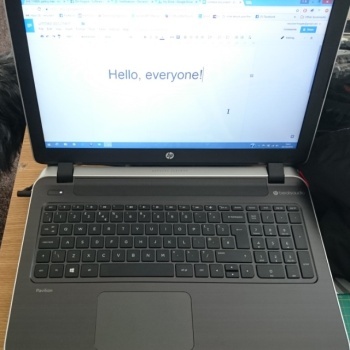 So, my husband went out last night and picked me up a new laptop! It is a Hewlett Packard Pavilion, and so far, I love it! It has those lovely slim and flat keys I’ve been desperate for since my old Macbook died a few years ago. It has a lovely 15.6 crystal clear display. It’s a quad core processor with 8 gig of RAM and 1tb HDD which will take me forever to fill up! I’ve decided to name this new laptop….Atlantis! Most of my kit is named after something in Stargate Atlantis, and this laptop will be the first I’ve named after the show title. A new book to write, a new NaNoWriMo starting soon, a new laptop to kick start everything! #FrankieWIP New Shifts, New Routine…All Mucked Up! Reason for being in story Can Man imparts advice to main character which will help her in solving the crime. Interesting points for character and run down 1) Can Man cleans the street with a broom on which is tied a red ribbon. 2) Not paid to clean the streets, just does so every day. 3) Ribbon on broom is from a little girl who gave him the broom to replace the one which was broken the day Bob saved her from being hit by a car. 4) Bob moves stiffly because he broke his leg in the incident. Obviously this is only for illustration purposes. A bio like this is only relevant for your major characters. There can be bit-characters, background people who do not need a backstory. But having a little backstory for your main characters makes them more believable, makes them come alive in the mind of your readers. A character bio will make your character come alive in your own mind, and allow you to create a well rounded, believable character. The character I’d like to show today is Kai Burton from my book Malevolence. He is the main protagonist of the story and much of it revolves around him. 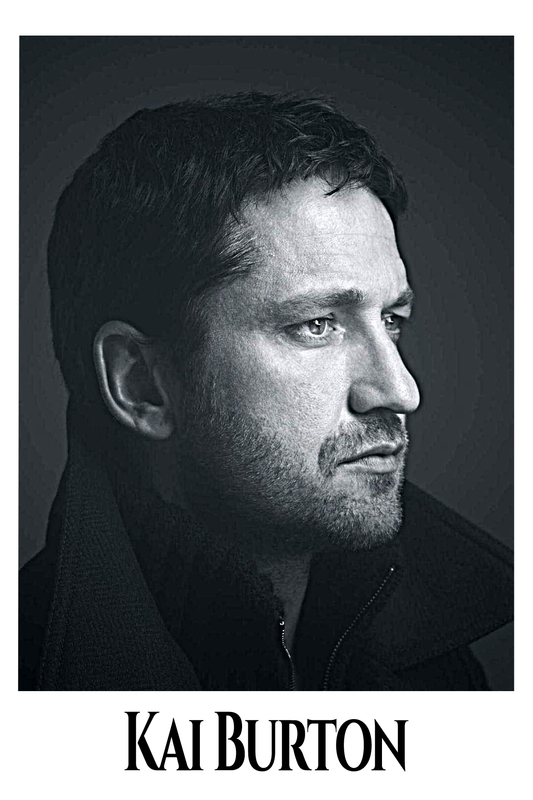 The person I feel resembles Kai the most is Gerard Butler. Though this isn’t an exact match, it’s near enough for me to base Kai’s character picture on Mr Butler. Body: 6’2” tall. Dark blue eyes, dark shaggy brown hair. Perpetual five o’clock shadow. Well built physique. Small scar above right eyebrow. Personality: Dependable, loyal, trustworthy and reliable. But also cynical, moody, stubborn and at times intimidating–especially following an event which took place two years prior to Malevolence. Interesting points for character After almost fifteen years of service in the army, Kai has his fair share of horror stories. He suffers from PTSD and crippling nightmares, though he does not allow this to define him. A very focussed and intelligent man, Kai is the one in the story who many rely upon for friendship and help. Run down Kai struggled to find work after leaving the army and answered an advert to join the team at fictional Kali Institute in Edinburgh as a paid research subject. He and his best friend Logan McKenzie both entered the Mentis A-3 trial, and both suffered the consequences. Kai became what is referred to as a Mind Adept; an evolved person who developed telekinetic and telepathic powers. But it’s not easy being a Mind Adept; it’s not like it is in comic books or movies at all. In fact, it is extremely punishing for those who evolved into Adepts, especially those who were left with the most powerful effects of the serum. Most of the Adepts struggle daily with their powers, some even withdrew from society after finding it too difficult to live near other people. Kai is one of the strongest Adepts. His mind is powerful, his abilities far reaching. He is able to hear and sense the thoughts and emotions of those around him and over quite a distance. He is able to project his own thoughts and emotions to others, as well as manipulate objects with his mind. But being this powerful has left him with a mind far more fragile than one might believe. He has a hard time dealing with his abilities, even though he has been in possession of them for over two years by the time Malevolence begins. Often overpowered by the thoughts of others around him, Kai struggles to maintain equilibrium within his own mind. 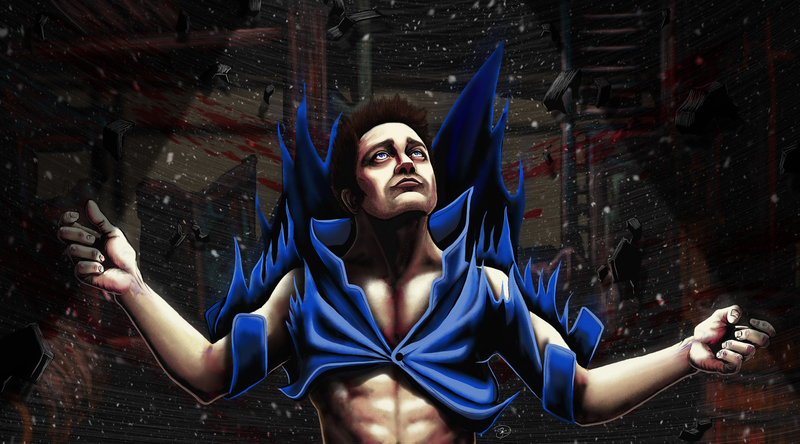 There are times his abilities overrun and he finds himself inundated with the psychological information from others. This can lead to a very dangerous condition called, Overload–something Kai has experienced on a few occasions. Kai has learned to protect himself against Overload and psychic saturation by blocking his powers. This puts him under a lot of psychological and physical stress, something which leaves him utterly exhausted. This is when he is at his most vulnerable and the danger of Overload is at its most high, therefore Kai tends to sleep a lot. This allows his brain to rest and recover from processing such large volumes of psychological information. If he does not rest, his powers get out of control and this can lead to dangerous situations. It is because of the danger his powers and mind pose that Kai made the decision to become a full-time tenant living within the Kali Institute. There are a few of the original test group living at the institute after self-contained flats were built in the below-ground levels following the disaster of the MA3 trial. Despite all of this, Kai is actually the most balanced of the Adepts. His regimented and disciplined mind allows him to wield his powers far more skilfully than almost all of the others. He is highly proficient in their use making him the second most powerful of all the Adepts. Kai’s belief that the Kali institute had a duty to care for those affected by the MA3 serum, and his convincing advocacy of this belief led to management creating the homes in the below-ground levels of the institute. It also led to the formation of training and counselling programs for those who struggled with their powers. Kai is driven to find Louise–creator of MA3–with the hopes of forcing her to reverse the effects, and bring her to account for what she did during the trial. As a result, he makes himself a target for her hatred and wrath.